38% of Tottenham’s conceded goals occurred after the 75th minute in Premier League. Everton have scored in 100% of their home matches in Premier League. 62% of Tottenham’s points have been earned away in Premier League. Tottenham were leading at halftime in 65% of their matches in Premier League. Tottenham have scored in each of their last 7 matches in Premier League. 75% of Everton’s points have been earned at home in Premier League. Tottenham have won 76% of their matches in Premier League. Tottenham have won 80% of their away matches in Premier League. Tottenham have scored 61% of their goals away in Premier League. Tottenham have scored in each of their last 10 away matches in Premier League. Huesca have failed to win in their last 15 matches in La Liga. 62% of Valencia’s matches ended up in a draw in La Liga. Leganes have been undefeated in their last 6 matches in La Liga. 50% of FC Sevilla’s conceded goals occurred after the 75th minute in La Liga. Rayo Vallecano conceded at least 1 goal in 88% of their home matches in La Liga. 88% of Valencia’s matches had under 2.5 goals in La Liga. Huesca have lost 75% of their away matches in La Liga. Leganes conceded at least 1 goal in 71% of their home matches in La Liga. FC Sevilla have scored in 75% of their away matches in La Liga. FC Sevilla have drawn their last 3 away matches in La Liga. Rayo Vallecano have scored 73% of their goals at home in La Liga. 61% of Rayo Vallecano’s conceded goals were conceded at home in La Liga. 67% of Leganes’s points have been earned at home in La Liga. FC Sevilla have been undefeated in their last 7 matches in La Liga. Rayo Vallecano have conceded the opening goal in 75% of their matches in La Liga. 75% of Levante’s matches had over 2.5 goals scored in La Liga. Levante have scored in 88% of their away matches in La Liga. Huesca have lost their last 6 away matches in La Liga. 69% of Leganes’s matches had under 2.5 goals in La Liga. 63% of Levante’s conceded goals were conceded at home in La Liga. Levante have drawn their last 3 away matches in La Liga. Valencia conceded at least 1 goal in 75% of their home matches in La Liga. Huesca conceded at least 1 goal in 100% of their away matches in La Liga. Levante have been undefeated in their last 5 away matches in La Liga. Valencia have scored 31% of their goals after the 75th minute in La Liga. Huesca conceded at least 1 goal in each of their last 16 matches in La Liga. Levante have scored in each of their last 6 away matches in La Liga. FC Augsburg conceded at least 1 goal in 100% of their away matches in Bundesliga. Wolfsburg have scored in 71% of their away matches in Bundesliga. FC Augsburg conceded at least 1 goal in each of their last 8 matches in Bundesliga. FC Augsburg conceded at least 1 goal in 86% of their home matches in Bundesliga. Aston Villa have been undefeated in their last 7 matches in Championship. 28% of Leeds Utd’s conceded goals occurred in the first 15 in Championship. Aston Villa have scored 2 goals or more in each of their last 7 matches in Championship. Aston Villa have scored in each of their last 7 matches in Championship. Aston Villa conceded at least 1 goal in 73% of their home matches in Championship. Leeds Utd have scored in each of their last 11 away matches in Championship. Leeds Utd have scored in each of their last 16 matches in Championship. Aston Villa have scored in each of their last 11 home matches in Championship. Aston Villa have conceded 2 goals or more in each of their last 3 home matches in Championship. Leeds Utd have won their last 5 matches in Championship. Aston Villa have scored 2 goals or more in each of their last 4 home matches in Championship. Padova conceded at least 1 goal in 100% of their away matches in Serie B. 35% of Cosenza’s conceded goals occurred after the 75th minute in Serie B. 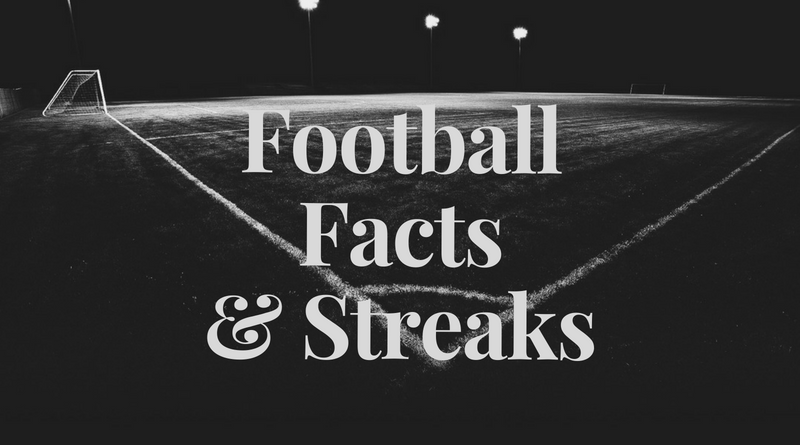 80% of Lecce’s conceded goals occured in the second half in Serie B.
Venezia have scored in each of their last 9 matches in Serie B.
Lecce have scored 65% of their goals away in Serie B.
Padova have lost 75% of their away matches in Serie B. 70% of Venezia’s points have been earned at home in Serie B. 67% of Cosenza’s matches had under 2.5 goals in Serie B.
Cosenza have scored 31% of their goals after the 75th minute in Serie B. 45% of Lecce’s conceded goals occurred after the 75th minute in Serie B.
Padova have scored in 88% of their away matches in Serie B.
Lecce were leading at halftime in 56% of their matches in Serie B.
Padova have scored 67% of their goals away in Serie B. 31% of Padova’s conceded goals occurred after the 75th minute in Serie B. 73% of Venezia’s matches had under 2.5 goals in Serie B.
Padova have conceded 2 goals or more in each of their last 7 away matches in Serie B.
Venezia have scored in 100% of their home matches in Serie B.
Padova have scored in each of their last 6 away matches in Serie B.
Ajax Amsterdam have won their last 10 matches in Eredivisie. FC Utrecht have scored in each of their last 10 matches in Eredivisie. De Graafschap have failed to win in their last 6 matches in Eredivisie. Vitesse Arnhem conceded at least 1 goal in each of their last 8 matches in Eredivisie. FC Utrecht have scored in 100% of their home matches in Eredivisie. De Graafschap have scored 33% of their goals after the 75th minute in Eredivisie. 68% of Vitesse Arnhem’s points have been earned at home in Eredivisie. FC Utrecht were leading at halftime in 56% of their matches in Eredivisie. Ajax Amsterdam have scored 2 goals or more in each of their last 10 matches in Eredivisie. De Graafschap have failed to score in their last 4 matches in Eredivisie. Ajax Amsterdam have scored in each of their last 5 away matches in Eredivisie. De Graafschap conceded at least 1 goal in 88% of their home matches in Eredivisie. 75% of Ajax Amsterdam’s matches had over 2.5 goals scored in Eredivisie. 82% of De Graafschap’s points have been earned at home in Eredivisie. Ajax Amsterdam have scored in each of their last 10 matches in Eredivisie. De Graafschap have scored 83% of their goals at home in Eredivisie. Ajax Amsterdam have been undefeated in their last 10 matches in Eredivisie. De Graafschap have conceded the opening goal in 75% of their matches in Eredivisie. 68% of FC Utrecht’s points have been earned at home in Eredivisie. FC Utrecht have scored 2 goals or more in each of their last 5 home matches in Eredivisie. Ajax Amsterdam have won 88% of their matches in Eredivisie. De Graafschap were losing at halftime in 62% of their matches in Eredivisie. FC Utrecht have scored 2 goals or more in each of their last 4 matches in Eredivisie. De Graafschap conceded at least 1 goal in each of their last 7 home matches in Eredivisie. FC Utrecht have won their last 5 home matches in Eredivisie.